Available from Efficient Power Converstion (EPC) in wafer level chip-scale packaging (WLCS) the discrete transistor have 80 (EPC2206) and 100V DS ratings (EPC2212). 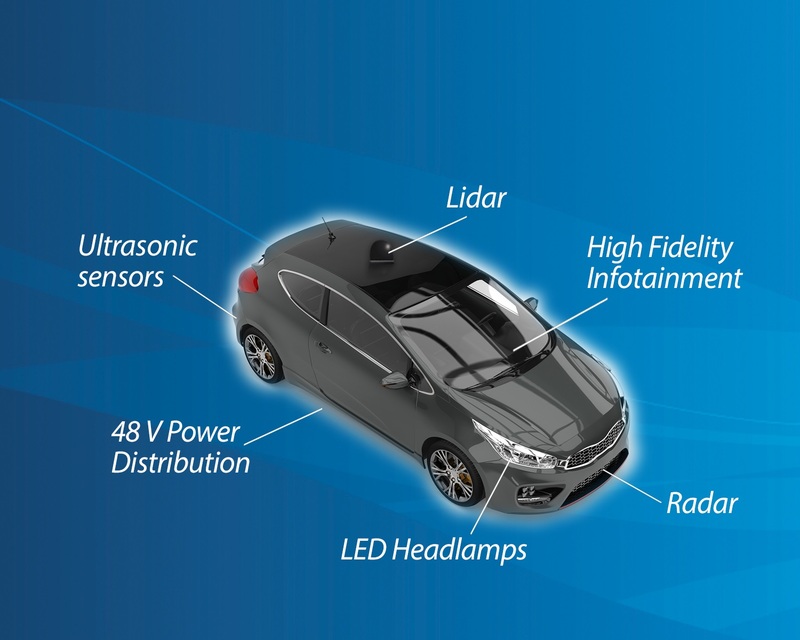 eGaN technology has been used in automotive applications, such as light detection and ranging (lidar and radar for autonomous cars. It is also used in 48 to 12V DC/DC converters in data centre computers, high fidelity infotainment systems, and high-intensity headlamps. The eGaN FETS will be followed by more discrete transistors and ICs designed for the harsh automotive environment says the company. The EPC2206 is an 80V, 2.2mΩ enhancement-mode FET with a pulsed current rating of 390A. It is suitable for vehicles using 48V bus power distribution to manage functions such as electric start-stop, electric steering, electronic suspension, and variable speed air conditioning. It is supplied in a 6.1 x 2.3mm chip-scale package. The EPC2212 is a 100V, 13.5mΩ device with a pulsed current rating of 75A and supplied in a 2.1 x 1.6mm chip-scale package. It can be used for firing the lasers in lidar systems because the FET can be triggered to create high-current with extremely short pulse widths. Short pulse width leads to higher resolution and the higher pulse current allows the lidar system to discern objects at greater distances. According to the company, both eGaN FETS are many times smaller and achieve switching speeds 10 to 100 times faster than their silicon MOSFET counterparts. Self-driving vehicles with systems such as lidar, radar, camera, and ultrasonic sensors are expected to place more demands on the vehicle’s power distribution system accelerating the move to a 48V bus system to increase efficiency, while shrinking size and weight and to reduce system cost.